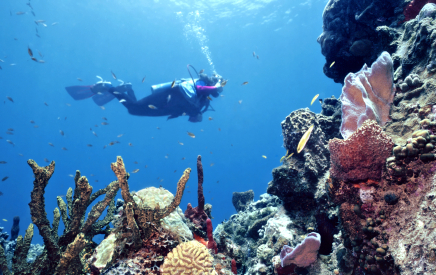 There’s no questioning the massive importance the Mesoamerican Reef (Belize Barrier Reef) has for the overall livelihood for Belize as a world famous diving and fishing destination. So it was with a good dose of trepidation that many stakeholders in the Belize tourism industry prepared to view the latest “report card” on the health of the reef. Every two years the Healthy Reef Initiative (HRI) issues the results of a fairly exhaustive study conducted by divers, who measure such things as the current numbers of carnivorous fishes and also the overall state of the hard coral. Dr. Melanie McField, Director of HRI says the current report ranks the state of Belize’s reef as “Poor”. “A slight improvement, it’s a little less poor than the last time. I would say that it’s close to crisis but it’s not fully in crisis. We have some components that are fairly easy to come back with the right management. We are on the verge of crisis but we are not in crisis. Our reef is a step above, its sick but it’s not terminal.” said McField. McField says one of the most important thing Belizeans can do to help repair the ongoing damage to the reef and Belize fisheries is to recognize and obey the laws regarding fisheries. She says if people would stop buying seafood out of season, then poachers would stop making illegal catches, and the sea life could rebound quite quickly. The Belize Barrier Reef, one of, if not THE major source of income for the entire country of Belize, has been in the media for quite some time now. With the threat of losing the status of a World Heritage Site, and the threat of offshore oil drilling, the health condition of our reef is at the forefront of the minds of almost everyone living in the country that is aware of its value. In San Pedro Town, it is the jewel that we take pride in having at our fingertips. It is a selling point for individuals marketing timeshares, condos and property on the island. It provides food for most fishermen that have made fishing their livelihoods. It provides a habitat for a vast variety of marine life and is home to some of the most beautiful corals in the world; all balancing a delicate marine ecosystem. On December 4th Healthy Reef Initiative (HRI) issued their 2012 report card on the state of the world’s second largest uninterrupted barrier reef. According to Dr. Melanie McField, Director of HRI, this is somewhat of an annual physical assessment of the reef’s health. The report looks at four specific indicators, two of which deals with the hard bottom of the reef. The other two components include measuring the amount of fish, and in particular the omnivores fish, such as parrot fish, tangs and surgeonfish. The fourth component is measuring the top predators or commercial fish such as the groupers and snappers. The 2012 Report Card highlights three focal sections: existing and emerging threats to the reefs health; an assessment on the current state of the reef and social context; highlights of reef conservation actions across the region, including the prioritized recommendations to foster healthy reefs and healthy people. Threats included: the rapid and widespread invasion of the exotic lionfish; climate change, with a fresh look at ocean acidification already in progress; marine-based threats, including plastic debris and oil exploration; land based threats, including sedimentation and nutrient enrichment; and finally urbanization, as measured through the proxy of ‘nightime lights”.